Here is some more dolls for sale. 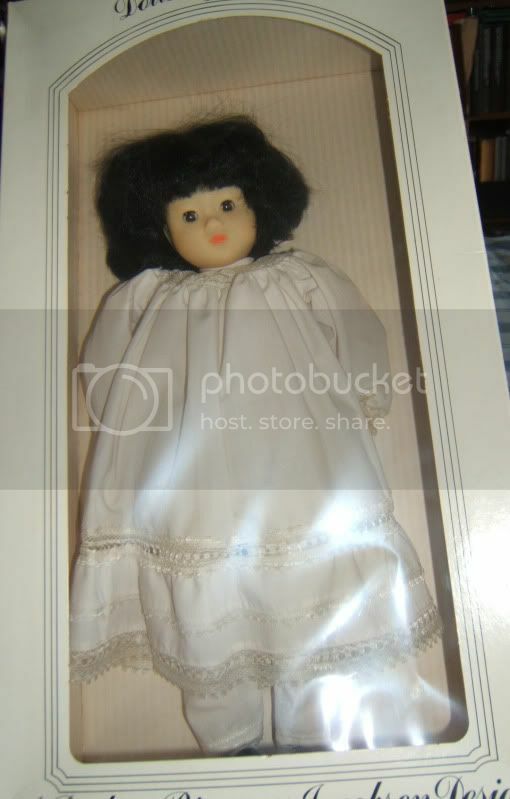 See my other posts about the Strawberry Shortcake blow kiss dolls, Mattel Dancerella, Remco Look N Love Dolly, and the Fisher Price "My Friend" dolls. I have pictures of everything if I don't add on one. Let me know if you want me to post it and I will. These are all my friend's dolls. She needs to sell to make her new husband happy (don't worry she gets to keep half of her collection lol). The bigger dolls have all been opened but only to display (or look at). Almost all of them have never been played with (expect the Dancerella doll). All the Barbies are NRFB. Let me know if you have any questions too. One side of the box has a little bit of browning on the box. There is a purple spot on the arm and one leg. There is some stickiness but I have washed her and added some baby powder to help too. Her skin really is super soft and is pretty cool feature. 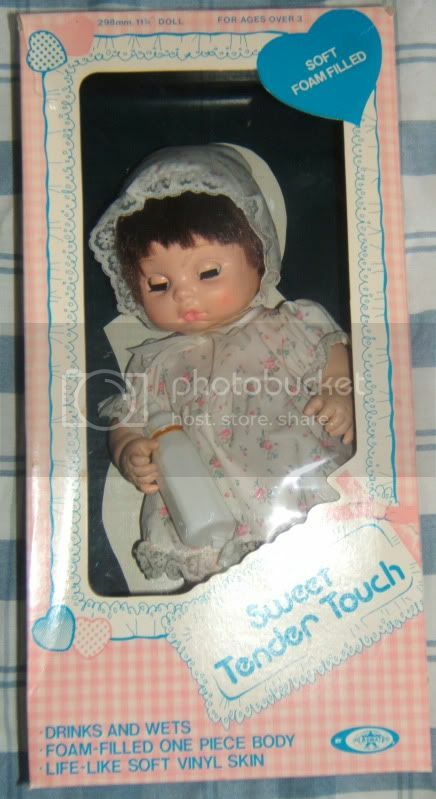 There is some glue on the dress that got there from the baby bottle that she has. This might come off, I'm not sure. She comes with her box and all her clothing! She has been displayed only. Her sleepy eyes work great! $10.00 + shipping takes her home to you. I have more pictures if you need it. Dolls by Pauline ("A Pauline Bjonness-Jacobsen Design"). "Ling Ling" Chinese doll, 18". (she's vinyal!) Has sleepy eyes that work. 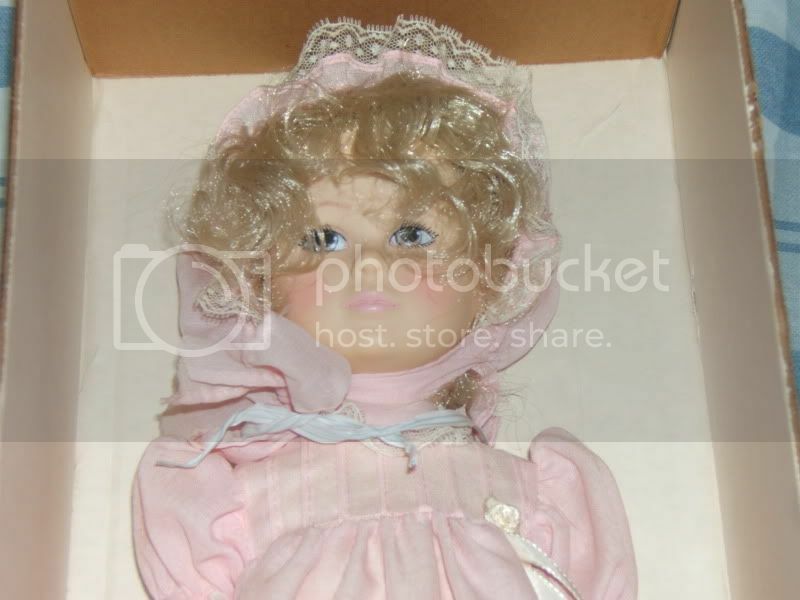 Not sure of the date of this doll but I'm gussing 80's? She has a soft cloth body, her box says she is model #V-112. Her hands look a slightly yellowed to me. She is pretty in person. I also get this great feeling that she could be a really cool doll to customize and make into a really creepy doll. lol $15.00 + shipping brings her home to you. 1984 Effanbee "Laurel" (Jan Hagara's Laurel). Model #7484 She's in really great condition! 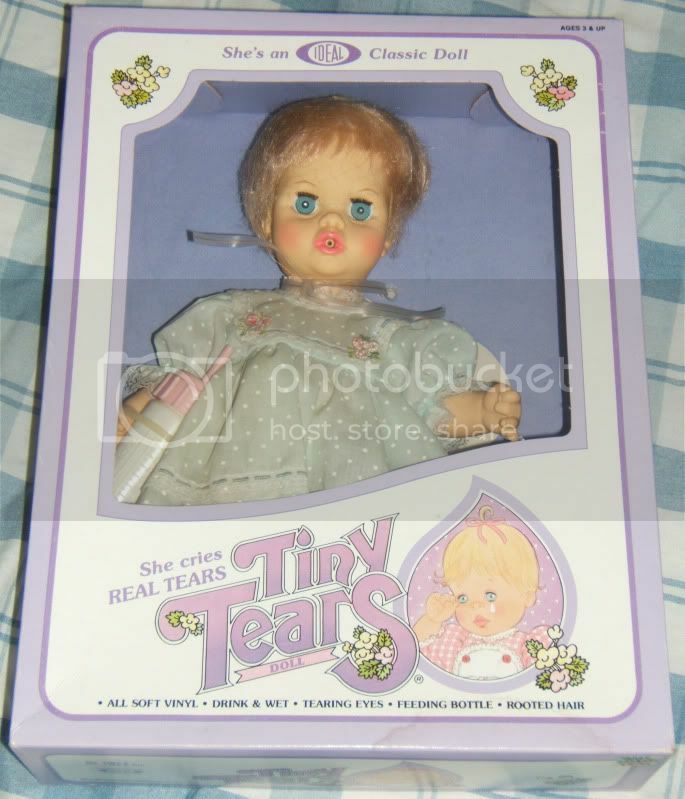 Again this doll has only been displayed like most of the dolls my friend has for sale. She's a larger size vinyal doll. 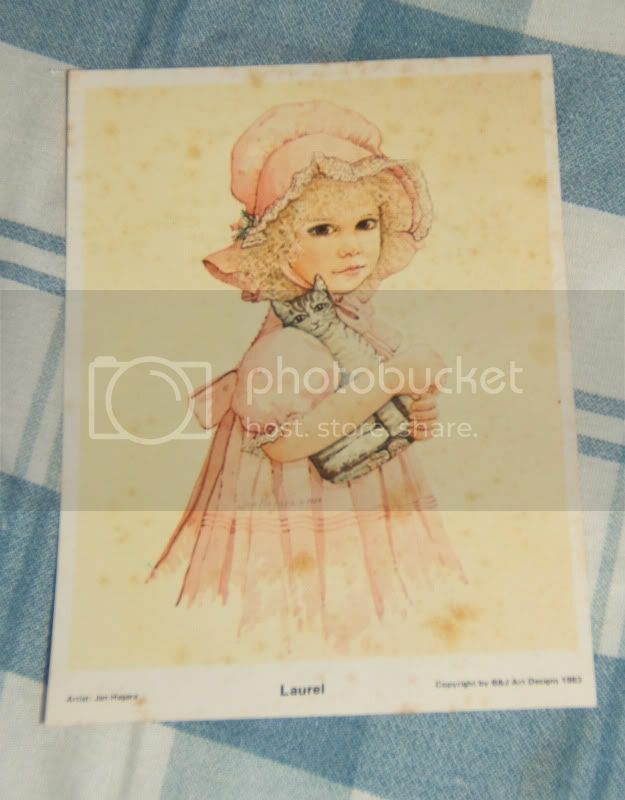 She comes in her box, has her mini poster (the mini poster is starting to have brown spots but I think it makes it look kind of cool for some reason), a catalog type booklet (1984 Effanbee) and has her tag on her wrist. Please note that the clear window on the box is coming loose. Very pretty doll, you'll love her in person. The pictures don't do her justice. $15.00 + shipping takes her home to you! I have more pictures of her, her box, and her paperwork if you'd like to see it. Has hair net still on head, her wrist tag, instructions, box, baby bottle, all clothing. She's in great condition and has been displayed only! She drinks and wets, tearing eyes. $10.00 + shipping takes her home to you! 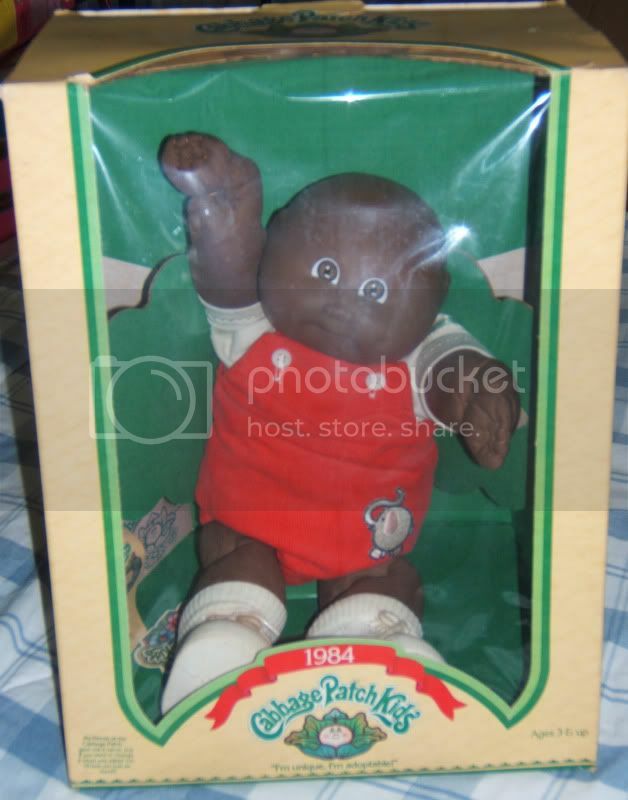 Two Cabbage Patch Kids doll by Colco. Black baby boy comes with box and paperwork. He even has his orginal birth certifacate that says his name is "Franni Andree". The box says 1984 on the front. He has his wrist tag as well. His clothing is super cute! The box has the upc cut out neatly (was there some kind of points on it?). I think he has a small scuff that is hard to see on his cheek. I held him in person and it's super faint if it is a scuff or rub. No paint is missing or anything. $12.00 + shipping takes him home! 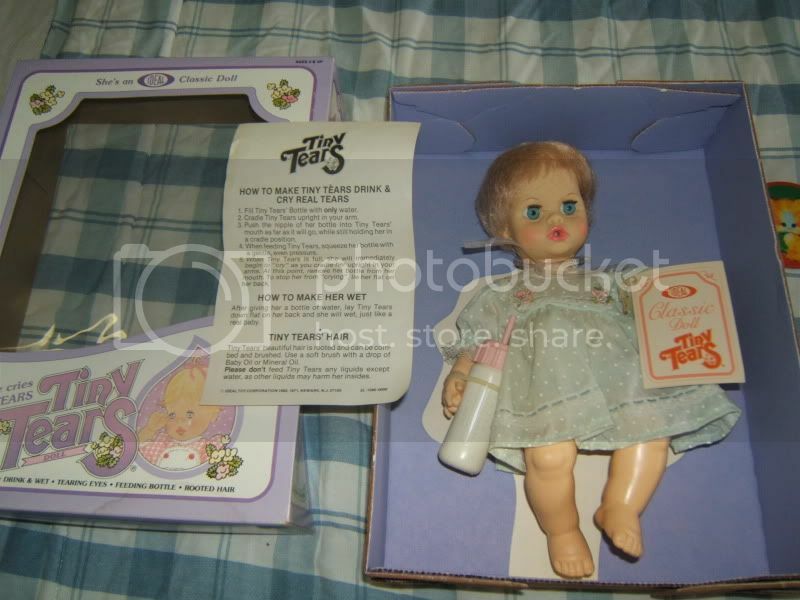 Pink yarn haired baby girl (white) might be a knockoff CPK but she comes in a real CPK box with all the paperwork and a birth certificate too. If she is a knock off (which I think she is) then she is a really good looking one. Her birth certificate says her name is "Claudie Nelie". There is a small spot on her leg which I'm not sure what it is. It kind of looks like a sticker sat there too long or something. $10.00 + shipping takes her home! 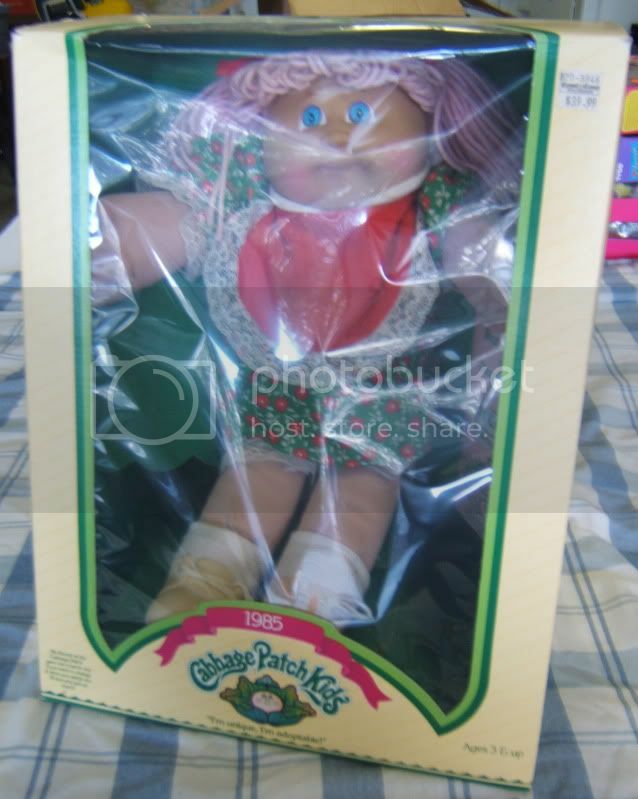 Cabbage Patch Kids Pin-Ups from Colco. It's a mini CPK doll that has velcro on his back. She comes with a playset that is a toy store and there is a plush stuffed teddy. The playset has a thing in the back that can be hung like a picture frame on your wall. 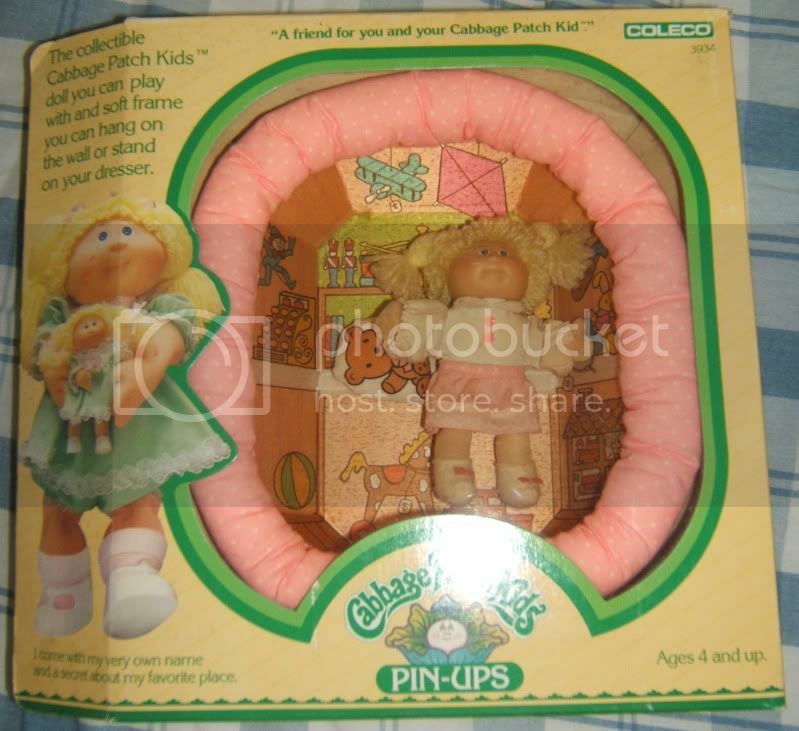 "The collectible Cabbage Patch Kids doll you can play with and soft frame you can hang on the wall or stand on your dresser." I think there is a tiny bit of dirt on the clothing which looks like it would come out it you gave it a gentle wash. Called "Suzie Caryn" & her Toy Store. Inside the box is the paperwork with the name on it. There is a light stain on the back of the stuffed teddy. The model number is 3934. $10.00 + shipping takes her home! 1995 Mattel "Flying Hero Barbie", "Flying Hero Teresa", and "Flying Hero Kira". I have pictures if you'd like to see them. $15.00 each (might take offers if you want to buy all 3 too). 1994 Mattel "Baywatch Barbie" and "Baywatch Ken". $15.00 each. (might take offers if you want to buy both). I have a picture if you'd like to see them. 1994 Mattel Barbie "Sunflower Teresa". Says it is a special edition or something on the box. The box is a little crushed on the side/front on the right. $8.00 obo. 1997 Mattel "Episode 30: "Lucy Does a TV Commerical". I Love Lucy doll of Lucille Ball as Lucy Ricardo. (Vitameatavegamin lol). There is a slight indent on the front from storage. 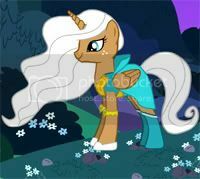 I have a picture if you'd like to see her. 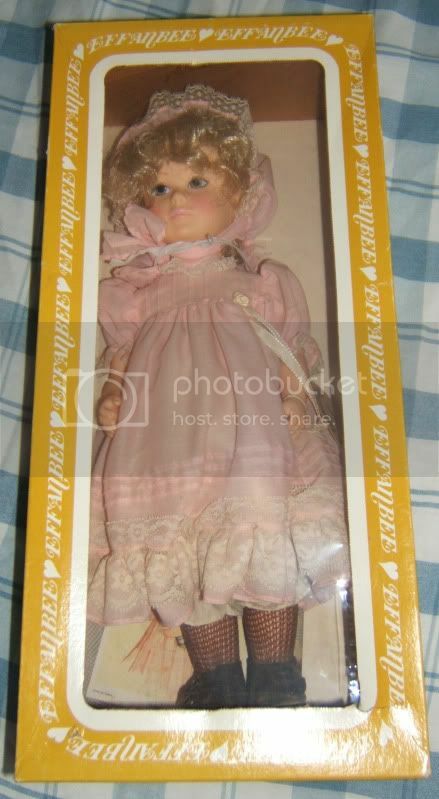 1996 Mattel Happy Holidays Barbie (I have several of her to sell)-Blonde. She's the one with the white fur hat and velvety red and gold dress. I have a picture of her if you'd like to see it. $20.00 each. If you'd like multiples I'd make a deal with ya. 1993 Tyco "Blossom" Russo and "Joey" Russo dolls. They are "Mix 'N Match Fashion Fun!" I have a picture if you'd like to see them. Very cool face molds! $15.00 each (might make a deal if you buy both).